Gilmartin Group is a strategic advisory firm that provides comprehensive service offerings throughout the lifespan of our client companies. We have decades of experience in Capital Markets, Investor Relations, Corporate Communications and Business Development / Strategic Advisory services. Our professionals have spent their careers on Wall Street with backgrounds in Equity Research, Investment Banking and Equity Capital Markets. We bring that experience and expertise to our clients to create durable shareholder value. At Gilmartin, we leverage our cross-discipline experience and team approach to deliver results. We recognize that no two companies are alike, and we tailor our work-scope for the unique needs and objectives of our clients. Ways in which we partner with our clients vary – we build customized investor relations programs for emerging growth companies, large caps or micro-caps; we act as an outside strategic consultant; and we help private companies navigate Wall Street and create communications strategies. Our track record of success is fueled by our unparalleled experience and the strength of our relationships among actionable investors and industry veterans. 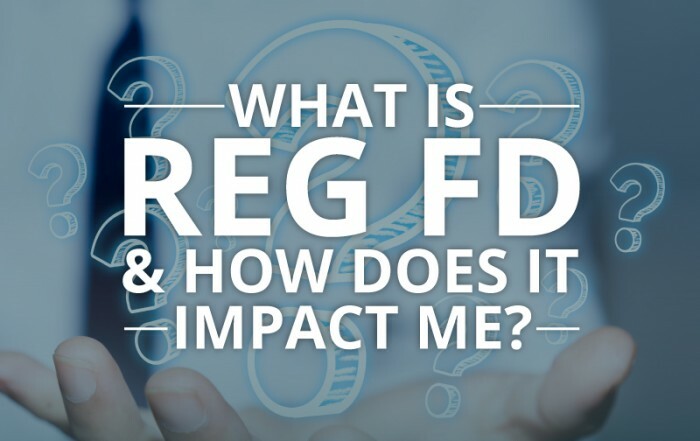 What Is Reg FD and How Does it Impact Me? 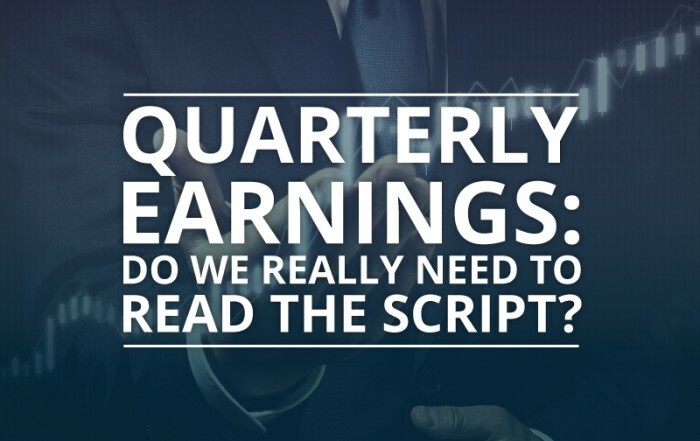 Quarterly Earnings – Do We Really Need to Read The Script? One of the worst Decembers in history. The sell-off in the equity markets continued in December, coupled with meaningfully greater volatility, resulting in exceptionally high losses in December. The S&P experienced its largest decline since the Great Depression in 1931 and its first negative year in ten years. In another history-making comparison: over the last 100 years, the DJIA has averaged a gain of 1.6% in December and has ended the month with gains 74% of the time. This past December, the DJIA was down 9.6% the month. Meanwhile, the Boxing Day rally was among the strongest we have experienced in ten years. December 26th saw one-day gains of 5.3% and 5.0% for the S&P and DJIA, respectively. For healthcare specifically, we look forward to the J.P. Morgan Healthcare conference Jan. 7-10 in San Francisco during which we will have a preview of earnings announcement and early-year M&A activity, setting the tone for the first part of the year. Broad healthcare sell-off…implications for the new year? 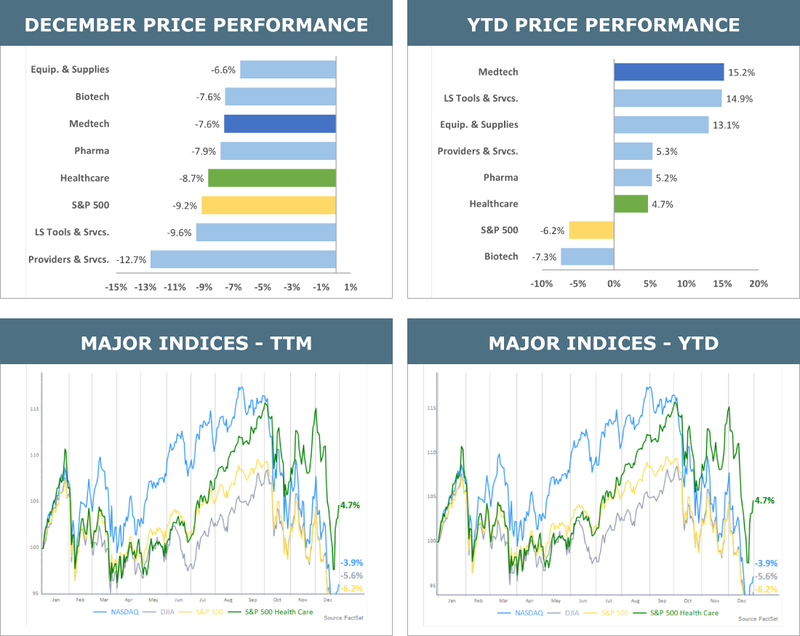 The healthcare sector was down 8.7% for the month – slightly better than the 9.2% decline in the S&P with biotech and med tech both down 7.6% on the month. Most strategists expect the increased equity volatility in late 2018 to continue into 2019 driven by expectation for rising interest rates, international tariffs, and trade disruptions. Within healthcare, expectations are for continued outperformance but driven increasingly by company fundamentals as relative valuations remain robust. What does the government shutdown mean for IPOs? The U.S. government shutdown has stalled the early IPO “wave,” but this could be quickly reversed if the government reopens in early January. 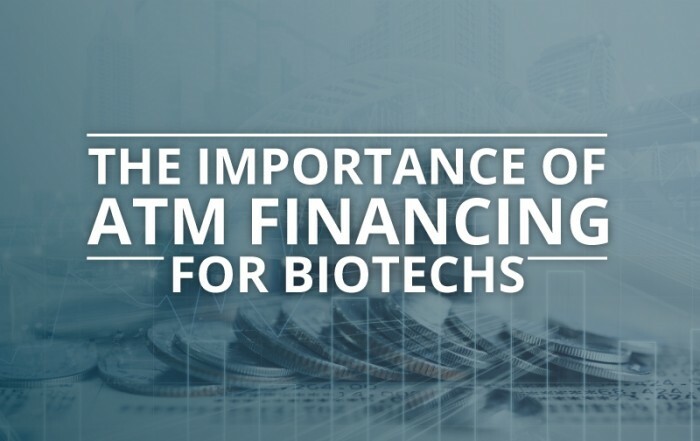 The life sciences IPO pipeline continues to build, with the recent volatility seemingly accelerating the pace at which companies are opting to ready themselves for an IPO should the market be receptive in 2019. As expected, December was a quiet month for IPOs. Moderna, highlighted in our November newsletter, ended up pricing at the mid-point of its filing range, raising $604 million for a market cap of over $8 billion (making it the largest biotech IPO in history). However, aftermarket performance was poor with the stock closing at $18.60 on the first day of trading and falling to $15.27 by the end of December. There was one other biotech IPO priced for Synthorx, which raised $131 million and traded up 58% by month end. According to Street Account, 2018 saw 78 Healthcare IPOs price raising a total of $9.8 billion. This compares to a total of 202 IPOs raising $61 billion for the year.